Routers & Gateways – DEOS Controls Americas Inc.
Sierra Monitor’s BACnet Router (FS-ROUTER-BAC) product offers a complete BACnet internetworking solution for BACnet/IP, BACnet Ethernet, and BACnet MS/TP networks, while also providing a secure connection to the cloud. The dual-port BACnet Router has two RS-485 ports, enabling connection to up to 64 BACnet devices without the use of additional line drivers. 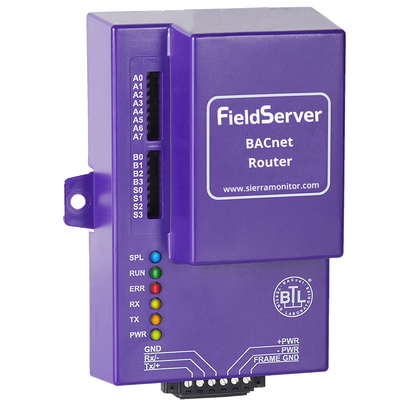 Using a BACnet router frees up valuable RS-485 ports on expensive BACnet Controllers and reduces the cost of connecting BACnet MS/TP devices to a BACnet/IP backbone. Compared to single-port BACnet routers, our dual-port BACnet router can reduce the cost of device connectivity or double the speed of connected devices (half the response time). As our entry-level and cost-effective BACnet solution, the single-port BACnet Router has one RS-485 port, enabling connection to up to 32 BACnet devices without the use of additional line drivers. DeviceFind™, our unique discovery feature, allows the integrator to discover all the BACnet devices connected to the router with one push of a button, minimizing time required for successful commissioning. Complementing this feature is our diagnostic FieldServer Toolbox, which allows the user or integrator to view the status of and diagnose all the routers on the network. The BACnet Router’s one page, set-and-forget configuration and unique network discovery capabilities minimize the integrator’s installation time. The fully compliant, top quality BACnet stack helps reduce troubleshooting time. An MDIX module makes it possible to use any Ethernet cable for commissioning and installation. DHCP automatically obtains IP settings from your network. The BACnet Router includes NAT support with a secondary BACnet/IP connection for routing between public and private networks. A BACnet Broadcast Management Device (BBMD) allows for connection between different subnets. Familiar, web-based configuration makes the system easy to use. Complete and submit the form below to request a quote on your next project. We are be pleased to provide you with a quote for any peripheral devices you need. To help us providie a more accurate quote, please describe the scope and details of the products needed for your project.